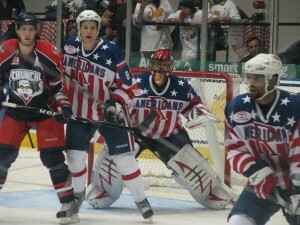 Salak Earns his First Shutout in Amerks 7th Straight Win · Let's Go Amerks! 10/25/2009.. Alexander Salak earned his first professional shutout and led the Rochester Americans to a 3-0 win over the goon squad known as the Syracuse Crunch. It was the Amerks seventh win in a row and also their fourth win in five nights and they’re not showing any signs of slowing down. With the win the Amerks are now in sole possesion of first place in the American Hockey League with 17 points. Graham Mink scored the game winning goal at 2:45 of the first period with assists to Mike Caruso and Chris Taylor. Caruso retrieved his own shot that went wide of the net and around the boards. He grabbed the puck at the blue line and dumped it back in right to Mink who was all alone to score. Jimmy Bonneau and Jon Mirasty fought for the third time in less than 24 hours at the half way mark of the first period. Bonneau is proving that he’s capable of being that heavyweight we’ve wanted here in Rochester. He’s also earning the respect of the coach which is evident by the ice time he’s getting. 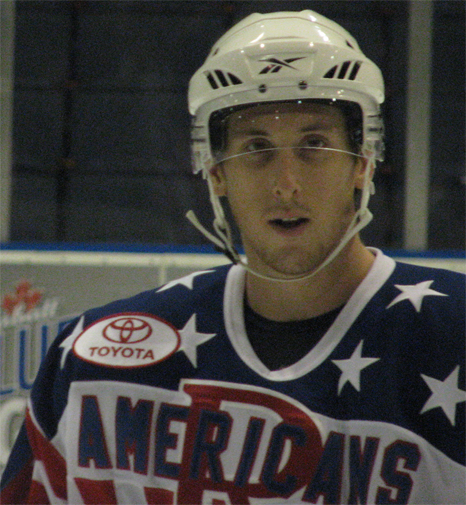 Jamie Johnson scored the Amerks second goal at 3:55 of the second period on the power play. Keaton Ellerby passed the puck to Mike York who put a hard shot on LaLande and Jamie Johnson was standing right there on the crease to put the rebound in the net. Alexander Salak played great though the entire game with his eye on the puck wherever it went. Going back to Saturday nights game he has held the Crunch scoreless for 110 minutes and 9 seconds. When we learned Tyler Plante hurt his knee last Wednesday some questions came up about Salak being capable of playing three in three. Tonight he proved he had no problems. There was never any question in the minds of the coaches about him playing all three nights. “I told him that he was in and that was it, he had no choices,” Groulx said. It helps that Salak can count on the defense in front of him. Keaton Ellerby has been playing his best hockey yet with the Amerks. He’s skating fast, controlling the puck, not losing the puck, and holding on to his stick. “If i give up a rebound the guys get it, they make our game really easier and it was fun to play,” Salak said talking about counting on the defense. One of the highlights of the game was a span of 94 seconds in the third period when David Brine, Evgeny Dadonov, Michal Repik, Keaton Ellerby and Clay Wilson were able to continuously cycle the puck through the Crunch zone. During that span both teams were playing five on five hockey. The Amerks put the puck into the Crunch end pretty quick preventing the Crunch from a line change. They recorded two official shots on net and a third that was wide. Shawn Matthias scored his first goal of the season with 37 seconds left in the game on the power play, assisted by Mike York and Clay Wilson. Matthias did a great job on the power play staying in front of the net during the power play. Wilson shot the puck from the blue line, Wilson took a stab at the first rebound and Matthias was there to keep the puck away from LaLande and put it in the net. And shortly after that is when things started to get nasty. Luke Beaverson and Kevin Harvey got tangled up along the boards. Harvey was wearing a full cage and not supposed to be fighting but that didn’t stop him from throwing punches at Beaverson. Beaverson was trying to punch back but had a tough time punching anything but a full cage. By the time Harveys helmet came off the linesmen stepped in. The second fight at the end of the game between Jimmy Bonneau and Jon Mirasty occured after Mirasty gave Salak a shove. Here’s a video I snagged off the TV screen. Somehow I didn’t hit record on my camera at the game. Rochester is on a seven game winning streak and is currently in first place in the American Hockey League. They’re playing great hockey together as a team and get better with each game. The fans are happy, the players are enjoying themselves, and the atmosphere inside the arena is the most exciting it’s been in two years. The Amerks only have one game in the next ten nights. They’ll have plenty of team to continue working together and building off of what they’ve done so far.